One thing I really like about being a blogging doggie is the swag. We get cool stuff and Tanner and I get to test it out and report back. That's fun. Lots of the goodies are given away as prizes, and that's okay. We can't possibly keep all of it. 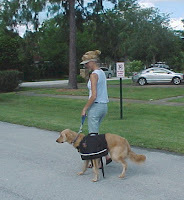 But today Mom crossed the line over at All Things Dog Blog. She announced that she's giving away a cool necklace that we got from Freaky Dog People. Mom called it a bracelet, but I'm not too sure what that is. I think it looks like a necklace, and it's just about the right size for little 9 1/2 pound ME! So, I'm on strike. No more blogging for me. If I have to give up my favorite prizes that I earned fair and square...well, that's just not fair. Could you guys tell mom to give me my necklace back? Pleeeeeze? Tanner and I are very excited. Super Bowl Sunday is coming up in 2 weeks and mom is planning her own fun. We love all the friends mulling around eating snacks and stuff, but we also like playing with the ball. How about you? Well, guess what? 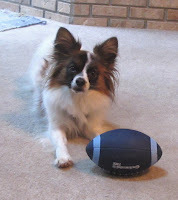 We can get our pictures taken playing football or even wearing silly costumes and join in mom's Super Dog Sunday Blog Hop. Tanner and I plan a competition to see whose pictures get more comments. Of course, I'll win. I've got that CGC thing behind my name. Doesn't that mean I win everything? 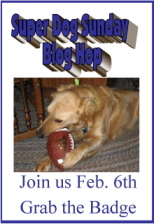 Anyway, I hope you'll join in the fun at our mom's blog hop. She created a webpage that tells all about it, so you can get all your questions answered. 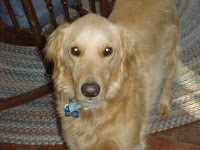 You can visit it here: Super Dog Sunday Blog Hop. There's an explanation of how it works, photo tips and all kinds of helpful stuff that I don't really understand. She even made up a 'badge' for it. Sounds sort of like a Boy Scout thing, but she says it's more like a sign to remind everyone about it. Here it is, and as mom always says, be sure to "Grab it." See you on February 6th. Here she goes again, giving stuff away. Today mom announced that she'll be giving away a Through a Dog's Ear CD. You know those music CDs that put me to sleep by making me so relaxed. Their creator, Lisa Spector, sent us one to try and boy howdy, did it work. Now mom uses it whenever we have a storm or there is some excitement brewing. I call it naptime! If you don't want your mom to put you to sleep, don't let her read the post at All Things Dog Blog. Good luck! I'm with Oliver on the Holiday business....Bah Humbug! We're glad the holidays are over! Our mom is injured and feeling a bit blue. She's trying to keep up with All Things Dog Blog, her household stuff and us, too. Oliver and I are busy trying to do our part to help. 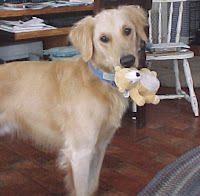 I'll take out the trash and Fetch just about anything I can pick up. Oliver can make sure mom isn't lonely. I guess it's time to check out her post on dog chores again. C'mon Oliver. We've got work to do! Oliver and Tanner don't want to miss out on the fun with the Blogpaws Blog Hop, so they've decided to join in too. 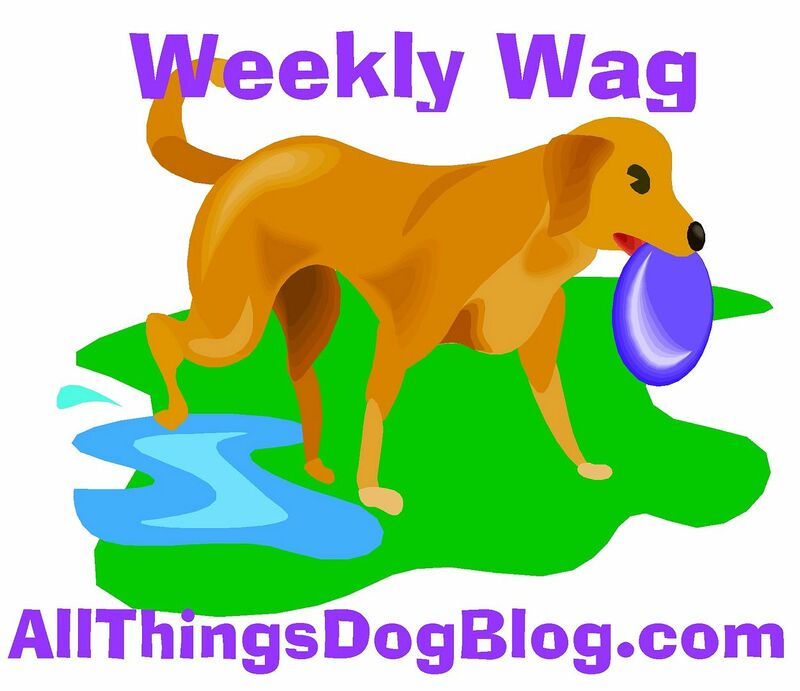 Be sure to catch the best shot of Oliver's redecoration over at All Things Dog Blog, where Oliver shows off his silly smile. 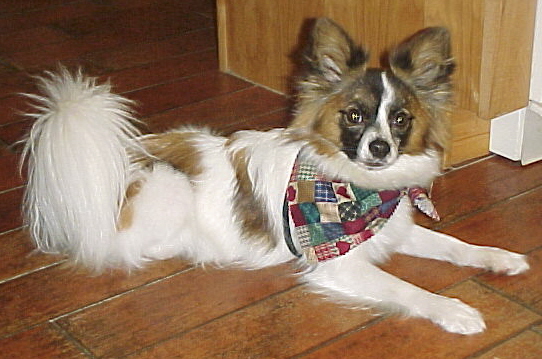 Want to have some fun looking at cute pet photos? All you have to do is click the pics you like. If you have a blog and want to join in, simply grab the code and follow the instructions. It's easy and fun! 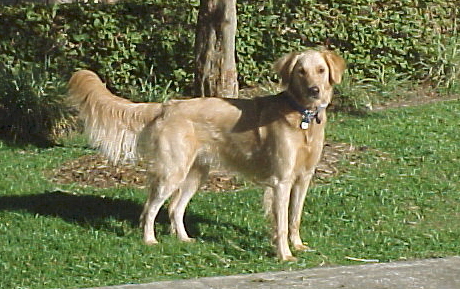 I'm a Golden Retriever....you guys know that, right? I know I'm not the typical looking version, but my mom loves me. That's all that matters to me. 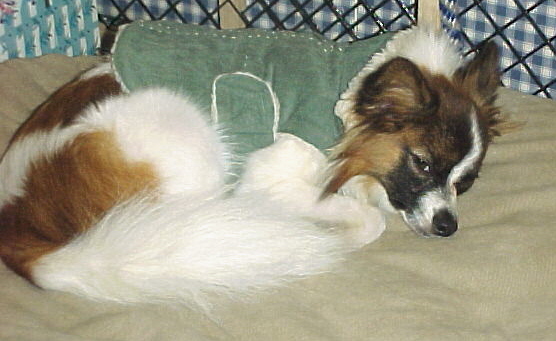 Today she's reminiscing about Xena, my packmate that we lost recently. 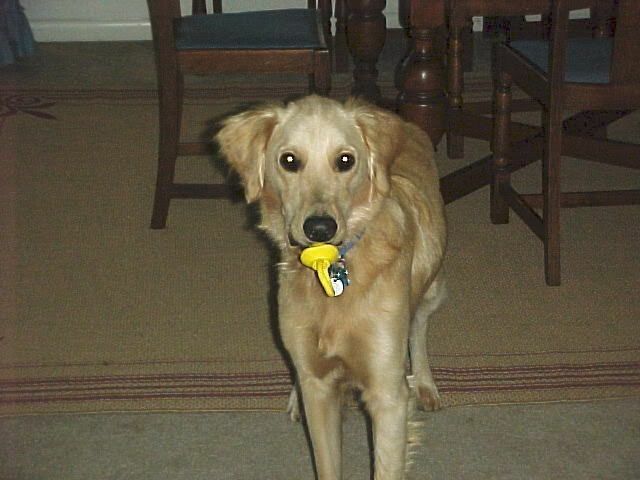 Just like any other Retriever, Xena liked to carry things around in her mouth. 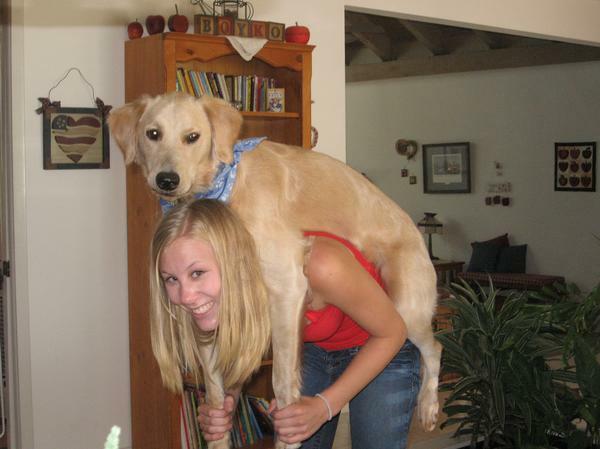 It's a Retriever thing, I guess, but I never do it. No, not me!